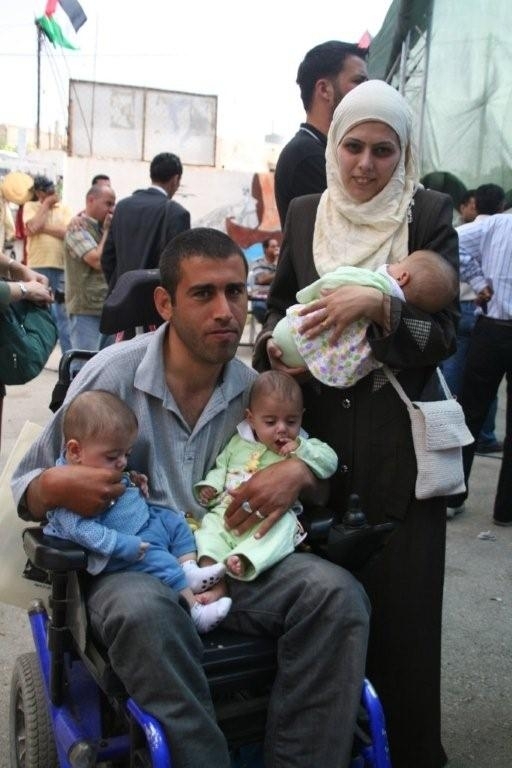 Rani Burnat has been wheelchair-bound since being shot in the neck by a sniper in 2000. The shooting occurred during a demonstration in Ramallah on the second day of the second intifada. The injury has left him paralyzed from the chest down, with a head wound from which he is still recovering. Despite the difficulties, Rani — now 30 years old — has since started a family and is the proud father of triplets. In spite of his severe handicap, Rani continues to attend demonstrations against the separation wall in his village of Bil’in on a regular basis. Over the years of protest Rani has been beaten and shot numerous times by the forces of the occupation, and his wheelchair has sustained repeated damage. Rani’s medical equipment demands constant care and gets worn down quickly. Every several years he needs to replace his worn out wheelchair. He further lacks basic items such as a special mattress to prevent pressure sores and a standing unit. These problems unfortunately worsen his condition. Throughout the years of struggle in Bil’in, Rani has been documenting on camera the demonstrations and night invasions. His photographs, as shown in exhibitions, tell the story of the village from his point of view, showing natural talent for photography. Rani has prepared a CD with selected photographs which will be given as a thank you gift for donations.